TORONTO - U.S. Steel locked out almost 1,000 unionized workers at its facility in Nanticoke, Ont., Sunday, raising questions from employees about promises the company made to the federal government about continuing production in Canada. The company shut the gates of its Lake Erie Works plant, located about 130 kilometres southwest of Toronto, at 9 a.m. just as it had warned it would, leaving hundreds of angry workers gathered outside. "The gates are now closed on one of the most productive steel mills in North America, one of the most efficient steel mills in North America," said Bill Ferguson, president of Steelworkers Local 8782. "From what we can see, production has been shifted to the United States." U.S. Steel makes steel for a number of operations from cars to building construction. It bought one of Canada's largest steel manufacturers — the Hamilton-based company formerly known as Stelco — in 2007. The purchase triggered a long dispute between the federal government and the company over broken promises U.S. Steel made to secure approval to buy Stelco. The two sides settled the case in late 2011 with an agreement that saw the company promise to keep producing steel in Canada for at least another four years and make major capital investments at its Canadian mills. In wake of the lockout, Ferguson said the union was now wondering what exactly the terms of that agreement were. "Nobody knows what's going on here," he said. Notice of Sunday's lockout was sent to the United Steelworkers Union on Thursday under a mutual agreement to give 72-hours notice of a strike or lockout. On Tuesday, the union membership had voted 70 per cent to reject a final contract offer from the company that would eliminate cost-of-living wage increases, reduce holidays and amount to a virtual standstill in wages. Ferguson said workers would have received an extra $1 an hour under the company's latest offer, but that had already been mandated under the cost-of-living clause in the previous agreement. According to the union, there are 978 members of the bargaining unit at Nanticoke. "It's a sombre mood, but there's a lot of anger," Ferguson said of the workers gathered outside the plant Sunday morning. The union offered earlier this week to keep its members on the jobs and negotiate further, but that was rejected by the company. "This was an operation that was probably a top plate operation in Canada. When it was sold to the Americans it almost became a second tier operation," Ferguson said, calling the company's current approach to talks with the union "radically different" from its predecessor. 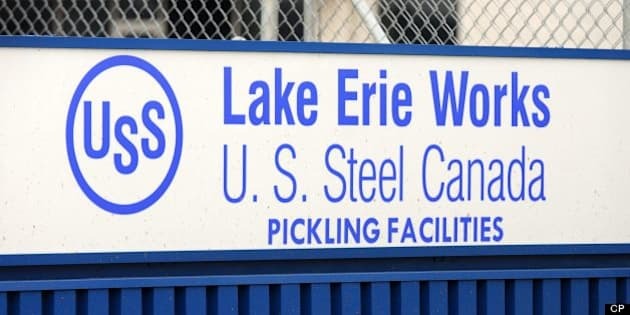 According to the company website, the Lake Erie Works facility makes 2.25 million tonnes of slabs and 3 million tonnes of high-quality hot rolled coils.